Richard the Lionhearted is often romanticised in fiction. However, Plaidy portrays him in a much more realistic way, with his good and bad qualities. The latter are above all his naivety and the notorious Plantagenet temper and are to blame for some of his mistakes that ultimately lead to his downfall. Richard begins his reign by setting off on a crusade, the hardships and trials of which Plaidy leaves to a great extent unembellished. For his good looks, charm, bravery, justice and integrity he is loved by everyone – that is, everyone except Leopold of Austria. Yet, what permeates his entire story is a great friendship (or, dare I say, epic love) between him and Philip the II of France, always mixed with hatred between the two rival kings. Plaidy presents all points of views, even those of yet again pushed aside women: most importantly, Richard’s wife and Queen Berengaria and his sister Joanna. The book, of course, ends in tragedy and death (which I don’t believe is a spoiler), not just for Richard, but for England, left at the mercy of his brother John, as Richard’s preoccupation with wars and male friendships and his neglect of poor Berengaria has left him heirless. Thus, what I have to look forward in Book 4 is the rein of violence and oppression of the erratic, self-serving, profligate king John. 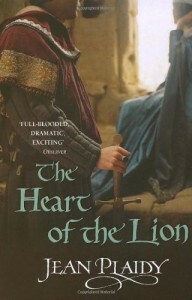 RECOMMENDATION: The Heart of the Lion is a well fictionalised tale of one of the most renown kings in the English history, Richard the I.